Popular psychic medium Rebecca Rosen's fresh and hip prescriptive program empowers readers to heighten their intuition, connect with deceased loved ones, and surpass the psychological roadblocks holding them back.In Spirited, readers learn how to dig into their past to identify the root of the "damage" that's keeping them from living their best lives. Medium-to-the-stars Rebecca Rosen shows us how to draw on the power of our intuitive gifts to connect with spirit energy loved ones who have passed to provide the clarity necessary to master real-life issues, including relationships, job fulfillment, finances, and body image.In her colorful and youthfully vibrant voice, Rosen recalls how she discovered her psychic gifts and recounts her experiences helping thousands of clients, including Jennifer Aniston and Courtney Cox Arquette. 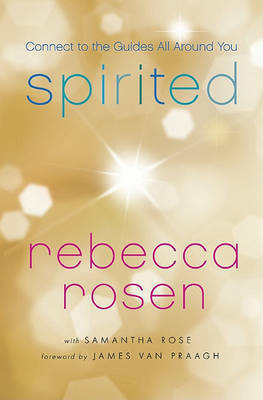 She reveals how she taps into a person's energy and relies on the spirits around him or her to gain insight, and explains how through exercises, meditations, and her special guidance we can develop similar skills to interpret the signs in our own lives and find success and contentment.Direct, down-to-earth, and sometimes sassy, Rebecca Rosen offers a unique and refreshing blend of self-help wisdom and psychic insight to help us look back and move forward."